Jim Fensome was not a native of Oakley but he was living in the village at the time he signed up to serve in WW 1. Jim was born in Dunstable, Bedfordshire on 1st December 1872. He was the sixth of eleven children born to James Fensome a miller and Maria Fensome a straw boat sewer (nearby Luton being famous for the production of straw hats). The 1891 census shows he had left his family home and was working as a carpenter’s apprentice. Two years later aged 20 years & 6 months having completed his six year apprenticeship he signed up to join the Royal Engineers. On 24th September 1895 Jim married Sarah Halls in Dallington, Northamptonshire. Their first child was born the following June in Luton. By that time Jim had been posted to India where he served for eighteen years. Sarah obviously joined him in India as three of their other children were born there, in Rookee, Bengal. Jim held the rank of Quartermaster Sergeant Instructor when he was discharged after completing twenty-one year’s service on 8th June 1914. One week later on 17th June the three younger children were registered at Oakley school. The family were living at “The Sun Inn”. Jim rejoined his Regiment at the age of 42 on 9th January 1915. The family left the village in July 1915 according to the school registers. 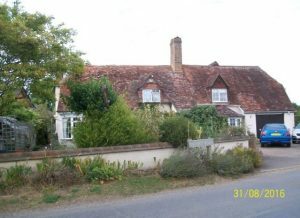 In 1939, he was living at 85 Saint Michael Grove, Farnham, Hampshire with his wife Sarah Fensome. Jim survived the war and died in Fareham, Hampshire on 23rd July 1947.